Executive Summary: This collection of 18 short stories and novellas spans the publication career of Alice Bradley Sheldon, who wrote chiefly under the pseudonym "James Tiptree, Jr." until her identity (and gender) was revealed. She also wrote under the name Racoona Sheldon, a persona also represented by a pair of stories included here. The stories included in this anthology span a wide range of sci-fi settings, from present day ("The Last Flight of Doctor Ain" and "The Women Men Don't See") to established outer space operations ("And I Have Come Upon this Place by Lost Ways" and "We Who Stole the Dream") to scientific or space exploration ("The Man Who Walked Home," "The Girl Who Was Plugged In," and "Houston, Houston Do You Read?"). There are a number of other stories that center the point-of-view in an "other" or "outsider" character, whether it's a human gripped by some form of madness or psychic distress ("Your Faces, O my Sisters! Your Faces Filled of Light!" and "With Delicate Mad Hands") or some type of far-future, evolved human or sentient, decidedly non-human alien ("Love is the Plan, The Plan is Death" and "Slow Music"). The breadth of the collection is truly staggering. One of the best-known works here is "The Screwfly Solution," which tells the story of a mysterious pathogen that is driving men all across Earth to commit femicide — murdering women without seeming to realize what they're doing. I will not spoil the reveal buried in the last line of the story, which gives some clarity to what's been taking place. Another story that has come to take on something of a legendary status is "The Women Men Don't See." In this one, a male narrator — Don Fenton, a comfortably middle-class businessman who has nothing much to distinguish himself — tells the story of an ill-fated jungle tour in Mexico when the chartered plane he's on crashes on a sandbar in a storm. He and Ruth Parsons, one of the other passengers, set off to cross a marsh in order to find help, leaving Ruth's daughter and the pilot, Esteban, behind with the plane. Don struggles to perceive Ruth as anything but a collection of types — a "Mother Hen" with her daughter, one of the countless "Mrs. Parsons" working in accounting and billing et cetera throughout the D.C. bureaucratic corps — but as Ruth begins behaving very strangely and mysterious lights and sounds accost them in the marshes at night, Don begins to realize that Ruth might be preparing to go to extreme lengths to get away from the world of men...the kind of men who refuse to acknowledge in her any individuality or unique humanity. One of the more heartbreaking stories in this collection of heart-breakers and gut-punchers is "Your Faces, O My Sisters! Your Faces Filled of Light!" This is a parallel narrative of the authorities and family members of a girl who has escaped from a psychiatric hospital, and the story of the girl herself, who believes that she is a courier in a far-future after the nuclear wars, when all men have died off. The collision of her beautiful fantasy world and the ugly, brutal reality that she (thankfully) can't see but is nevertheless tightening its net around her is a painful journey to go on, but one that is beautifully rendered. Feminist Future: There are a number of feminist futures (and presents) on display throughout Her Smoke Rose Up Forever. And, truth be told, most of them are pretty grim. These are stories where individual women and groups of women are victimized by men just as a matter of routine, where women are expected to perform scientific as well as sexual roles for their male crewmates during space exploration, and about women in societies where men have vanished, but (unlike Herland) hardly find themselves at peace in a worry-free utopia. Hope for the Future: These are not hopeful futures. 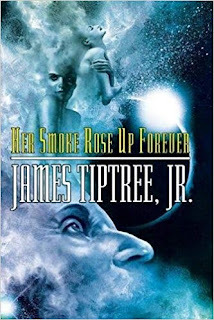 The worlds of James Tiptree, Jr. reflect in various far-flung settings a profound, nuanced, and lived-in understanding of the big and small ways in which women might be victimized, ignored, made invisible, or treated like property throughout most of the 20th century. Alice Sheldon took her lived experiences, which clearly filled her with a pervasive sense of righteous outrage, and transposed them into speculative frameworks that could illuminate her struggles and the struggles of women more broadly. By couching daily rituals of degradation or possessiveness in narrative and genre trappings, Sheldon was able to discuss and probe with deep empathy the effects of gender inequality that plagued her own era, and many of which sadly persist to this day, despite some progress. So in that way, thirty years after her death, her pessimism was at least partly justified. 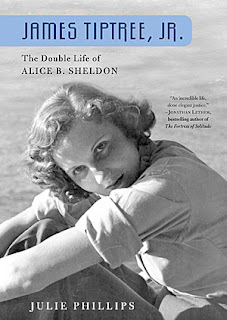 Legacy The work of Alice Sheldon inspired generations of female authors who felt that, for the first time, they were able to see themselves in science fiction. At a time when Arthur C. Clarke was writing stories where a hyper-intelligent ape might be a member of a space crew but a woman could not, Alice Sheldon was telling stories with female protagonists that could make women who experienced the same kinds of societal constraints that she did feel seen. That she had to do it in the guise of a man was instructive to the science fiction community at large, and Sheldon's contribution remains memorialized today in the James Tiptree, Jr. Literary Award and Tiptree Fellowships. In Retrospect: First, a quick primer on "James Tiptree, Jr." For a wonderful audio profile, check out this story from KCRW's Unfictional in 2015. Tiptree appeared on the science fiction scene in the late 1960s with a string of short stories that immediately landed on lists for the top awards in the field, but he never arrived to pick up the awards. Never made personal appearances at all. But Tiptree kept up correspondences with a number of fans and young genre authors, particularly young women. Known to these correspondents as "Uncle Tip," Tiptree wrote overtly sexual, explicitly phallic stories in a muscular, brash style that often centered on female protagonists or on men confronted with a woman or group of women who explode against their plans, perceptions, or worldview, forever altering or imperiling them. In the landscape of late-1960s science fiction, this was a startling anomaly. Men simply didn't write women's stories in that field. Women's stories largely weren't told — unless women were included in roles like the ones in which Don Fenton saw Ruth Parsons...secretaries, mothers in the background of men's stories, assistants, etc. So people began to wonder if maybe James Tiptree, Jr. wasn't secretly a woman. It's hard to imagine this detective work coming from anything but a place of ill will. Whether to discredit the stories or the author, the digging into who Tiptree *really* was ultimately forced "Uncle Tip" to come clean as Alice Bradley Sheldon, formerly of Army intelligence and the CIA. Alice Sheldon and Racoona Sheldon never received the acclaim James Tiptree, Jr. did, but the work remained astonishing, gripping, and bleak. In reading Tiptree, I couldn't help but be reminded of Flannery O'Connor in that wherever the stories started or whichever direction they may start heading, they would always veer hard to death. Characters don't get happy endings, hope is inevitably extinguished just when it seemed likely to pay off, and those misgivings nagging at the back of characters' minds always turn out to be harbingers of a doom lurking just up ahead. The writing veers from aggressively straightforward to experimental, but the characters remain vibrant and engrossing. Even though plowing through this anthology winds up taking a toll, making the world look perhaps a little more gray, a little less trustworthy when you look up from the pages, these stories represent a towering body of work. Published by Vance K — co-editor and cult film reviewer at nerds of a feather since 2012. Feminist Futures: The Future is Female!